Our Wish List is also available on Amazon.com. When you make a purchase from this list, it will ship to the Reinhart Guest House. Wish list donations make our house feel like home. The products you need in your house, we need in ours. Opportunities to support the Guest House are numerous and may include a donation from our wish list, sponsoring a family’s stay or helping us restock our pantries and refrigerators with healthy foods for our guests to enjoy. We kindly accept any new, unused and unexpired items. 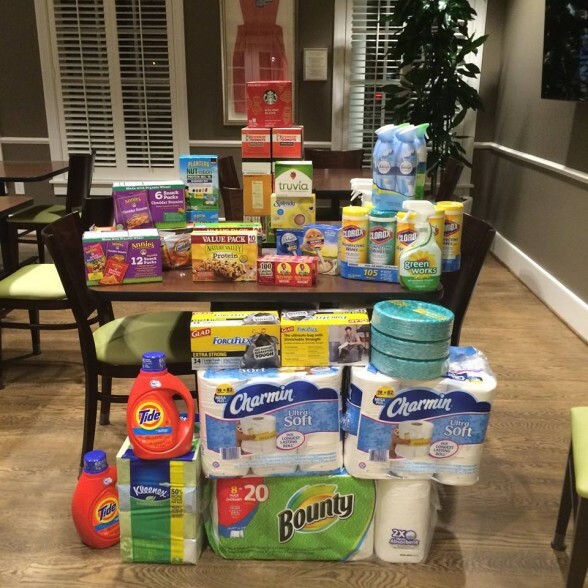 Wish list items can be brought to the Reinhart Guest House at 1100 Libbie Avenue, Richmond VA 23226 any day of the week between 8:00 a.m. and 7:00 p.m.
To download our ongoing wish list, click here. Wish list items can be brought to the Reinhart Guest House at 1100 Libbie Avenue, Richmond VA 23226 any day of the week between 8am and 10pm. The Guest House wish list is also available on Amazon.com. When you make a purchase from this list, it will ship directly to the Reinhart Guest House!